When someone who rarely reads science-fiction says that a particular book is light on the SF aspect which could be read by anybody (even those who don’t like SF) I always groan inwardly (Only if some of my dependable Goodreads friends who read SF regularly tell me that even though a particular SF book is light on the science aspect but it's good, I give it a try). Because for me, the "light" often means that the author is trying to hide his/her own weaker grasp of science from his/her readers. In fact, I am currently reading one such book whose author claims that his main aim was to create memorable characters rather than concentrating on world-building. Liking his characters must be an acquired taste as I am finding his characters absolutely dull, one-dimensional and criminally forgettable, to say the least. And given the length of that particular book (more than 500 pages), the time that I have already invested in it (more than halfway through), means that I can’t really abandon it now. If I am ever going to regret my decision of reading one book in my lifetime while I am on my deathbed, that book is definitely going to be the one. The reason why I am saying all this is because more often than not I avoid reading books which claim that although they are SF, they are more about the characters rather than the world they are set in. I believe that one needs to balance everything in order to write good SF. You cannot write good (read interesting) books by sacrificing one of their essential props for the sake of some other. So, I am not going to say that [b:The Player of Games|18630|The Player of Games (Culture, #2)|Iain M. Banks|http://d.gr-assets.com/books/1166984450s/18630.jpg|1494157] is more about its characters than other things. I would rather say that it’s a perfectly balanced work of a genius who knew what he was doing. And if it seems to us readers that despite being spare on the SF aspect, this novel is tasteful, it is because Banks prepared this dish with the right amount of ingredients. The book follows a game player, Chiark-Gevantsa Jernau Morat Gurgeh dam Hassease (let’s just call him Jernau Gurgeh from now on) who is bored by his perfect life in the utopian Culture universe. Let’s face it, even reading about utopias isn’t exactly that exciting, so we can really sympathize with Jernau Gurgeh on that point. Even Banks realized that, so our game player is sent to contest in a game called ‘Azad’ in an imperialist world outside the Culture universe. Hence begins an allegory which compares the two polarizing ideologies – imperialism and anarchist-socialism – with coherent arguments. Most people agree that socialism is the next step in the evolution of human civilization. But that time seems very far away (if it ever comes, that is). I have always believed that for socialism to work, first there should be an abundance of everything; from technology to basic needs such as food and shelter, which could be provided to each and every human being with proper management and without any rationing (Yes it's wishful thinking, but we are talking about utopias here). And we also need to weed-out the stringent controlling factors that socialism places on its people. Enter anarchist-socialism. In other words, enter the Culture Universe! Many have said that [b:The Player of Games|18630|The Player of Games (Culture, #2)|Iain M. Banks|http://d.gr-assets.com/books/1166984450s/18630.jpg|1494157] is the grown-up’s version of [b:Ender's Game|375802|Ender's Game (Ender's Saga, #1)|Orson Scott Card|http://d.gr-assets.com/books/1364033163s/375802.jpg|2422333]. It’s not. It’s not about games at all. It’s about how we should be living and more than anything, it’s about how we are living right now. It’s about human empathy. Or the lack thereof, in today’s world. It’s about what we have already missed as a civilization and are going to miss in the times to come if we don’t expand our cognizance in the right direction. 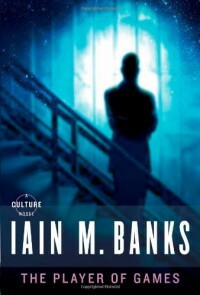 This is my first [a:Iain M. Banks|5807106|Iain M. Banks|http://d.gr-assets.com/authors/1352410520p2/5807106.jpg] novel (surprise! ), and while I am cursing myself for not reading him earlier, I do have the consolation that I won’t run out of his books to read for some foreseeable future. It’s sad that such a genius is no longer amongst us. But I like to think that he is lounging somewhere in the real version of the Culture Universe now, despairing for our pathetic world while sipping martinis.